Mother’s Day is Sunday, May 10th, and this is our annual Mother’s Day Show! Happy Mother’s Day to all mothers, human and non-human! To start this show, we talk about the connections between mother cows, their baby calves, and society’s addiction to cheese. We’ll discuss our own past relationships with dairy cheese, and how those morphed into our current relationships with delicious plant-based cheeses. Then Alison will tell us a bit about Liberation BC‘s Cow Ribbon Campaign, an annual campaign that brings attention to ALL mothers for Mother’s Day. 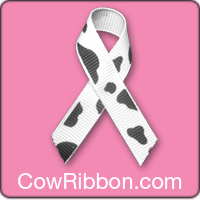 You can listen to a past interview that we did on the Cow Ribbon Campaign here. Our first interview is with author Alissa Hamilton. Alissa has a PhD in environmental studies from Yale University, and is an authority on food processing and marketing issues, having written for major publications and academic journals. She has spoken at TEDx Cambridge, has been a guest on the Dr. Oz Show, ABC World News with Diane Sawyer, and CBC-TV’s Marketplace. Alissa’s new book called “Got Milked?” is a critique of the dairy industry and dispels common misconceptions about dairy milk. 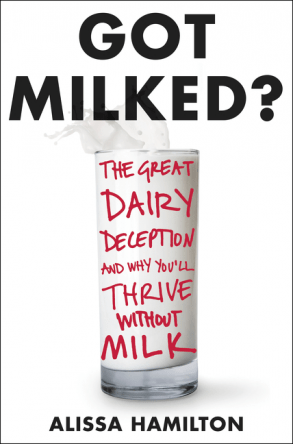 It looks behind the marketing and examines the enormous influence the milk industry has over our diets. In this interview, Alissa explains the history of how our society started consuming the milk of another species and how this habit transformed into the mega dairy industry that we know today. She also talks about how 65% of the human population is lactose intolerant (so why does the industry push milk on us as a healthy part of a human diet? ); discusses the industry’s and government’s messaging when it comes to the claim that milk builds strong bones and provides necessary calcium that we need; and talks about the role that governmental forces play in dictating what we eat. She also tells us why she thinks that dairy should be removed as its own category in the Canada Food Guide, and gives us her thoughts on calls to action that we can take against the deception of the dairy industry. We are also doing a book giveaway, where you can win one of three copies of “Got Milked?”! All you have to do is email us your submission for our draw with the subject title “Got Milked contest” and tell us what your favorite type of non-dairy milk is (or which one you would like to try). Email your contest entries to radioanimalvoices@gmail.com before 12:50pm PST this Friday. The winners will be announced at the end of the show at 12:55pm PST this Friday, May 8th! We will mail the books to our lucky winners! Congratulations to our winners Mary Finelli, Jean Hebert, and Sinéad Sanders! For our feature interview, we speak with Pam Ahern, who is the founder and Director of Edgar’s Mission. Edgar’s Mission is a not for profit Farm Sanctuary in Victoria, Australia that seeks to create a humane and just world for humans and non-humans. They offer sanctuary to farm animals in need while working to expand the public’s circle of compassion to include all animals. Edgar’s Mission endeavours to achieve this through education, advocacy and empowerment and promotes compassionate and cruelty free living. They currently provide life-long love and care to over 300 rescued animals, ranging from cows to sheep to chickens to goats. 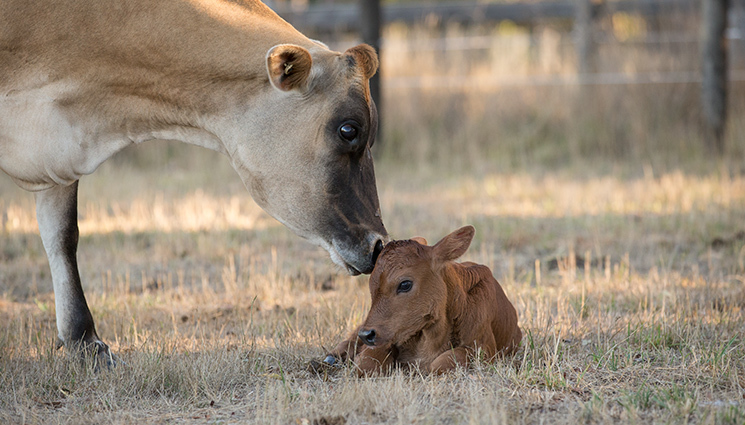 For our Mother’s Day Show, Pam shares with us some touching stories about mother cows and calves Clarabelle and Valentine, and Pixie and Dixie, who all live at the sanctuary and who are able to express the natural mother-child bonds that all animals wish to articulate. She also shares with us some beautiful stories of other animals at the sanctuary. This is an interview not to be missed!